Fr. 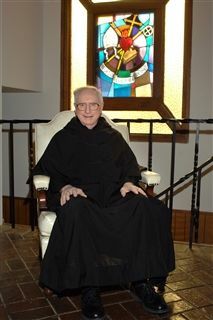 John Gaffney, an Augustinian priest and teacher, passed from this life on Tuesday, March 19 at Montereau in Tulsa. He was 20 days short of his 100th birthday. In his 80 years as a professed Augustinian Friar, Fr. Gaffney enjoyed a 43-year teaching career, 33 of which were spent at Cascia Hall Preparatory School. Fr. Gaffney was born on April 9, 1919 in Wilkes Barre, Pennsylvania. Shortly after graduating high school in 1937, he began his seminary training at the Augustinian Academy in Staten Island, New York. “I believe I had a cradle vocation,” he once said. “I wanted to be a priest since fourth grade. It was a desire in my mind and heart that I never analyzed.” Fr. 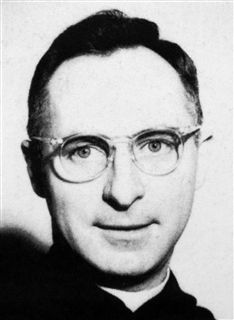 Gaffney professed his first religious vows in the Augustinian Order in 1939. 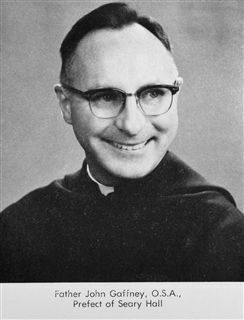 After he solemnly professed his perpetual vows in 1942, he proceeded to advance his education and was ordained to the priesthood in 1945. The Augustinians are primarily a teaching order, and Fr. Gaffney was ordered and educated to become a teacher, an assignment he accepted with great love and humility in spite of a personal wish to work internationally. 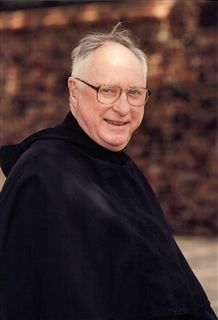 He earned a Bachelor of Arts in Philosophy from present-day Villanova University, furthered his theological studies at Augustinian College in Washington, D.C., and earned a Master of Arts in English Literature from Catholic University of America in 1945. Although initially disappointed about teaching, Father Gaffney found that “enlightening young minds” in the subjects of grammar, composition, literary appreciation, and public speaking was his true vocation. Fr. 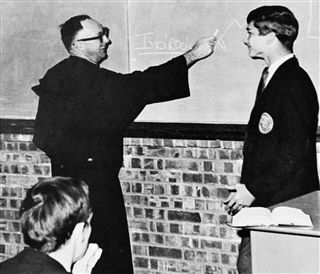 Gaffney was assigned to Cascia Hall in 1954 where he served as a teacher, dorm proctor, chaplain, vocations director, and department head before retiring from the classroom in 1989. He continued to tutor middle and high school students for several years and for two more decades served in a variety of pastoral capacities such as celebrating daily Mass, filling in at various parishes, hearing confessions, and visiting the sick. “Fr. Gaffney’s deep love of God, his priesthood, and the Augustinian order has been clearly evident over his many years of dedication to Cascia Hall,” said former headmaster Fr. Bernie Scianna, OSA, PhD. Fr. 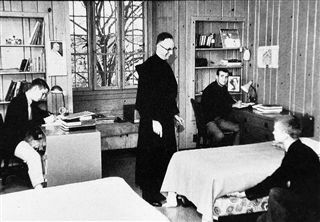 Gaffney lived at the Cascia Hall Monastery in retirement until he moved to Montereau in 2012. On the occasion of his 90th birthday in April 2009, to recognize and thank Fr. Gaffney for his more than 54 years of service to the Cascia Hall community, the School Board of Directors established an endowment in his name, the proceeds of which would help fund the annual salary of the English Department Chair at Cascia Hall. Donations to this endowment in his honor can be made to the Rev. John H. Gaffney, OSA English Department Chair. For more information, contact Mrs. Sandy Willmann, swillmann@casciahall.com, 918-746-2614. Services will be held at St. Rita of Cascia Chapel. There will be a Visitation on Sunday, March 24 from 2:00 – 5:00 pm. The Mass of Christian Burial will be celebrated on Monday, March 25 at 10:30 am followed by burial at Calvary Cemetery in Tulsa.